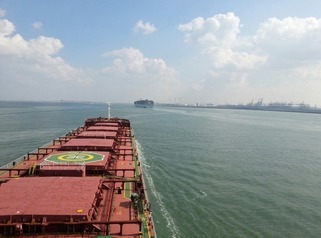 25-Mar-2014 -- As a maritime pilot in the port of Rotterdam I have passed this confluence many times in the past years. The position of the confluence does not make for an easy target and the circumstances are not always right to pass over it. A lot has changed since the last time this confluence was visited in the year 2004. To the south the 'Maasvlakte 2' has been claimed from the North Sea. In the North Sea, 2.2 km from land.